Basic descriptions of blood cell types. See the Elektronenmikroskopischer Atlas im Internet for (mostly unlabelled) EM images of blood cells. Examples from peripheral blood smears. How to look at blood smears. Images of hematopathology, from WebPath. Red blood cells (abbreviated RBCs, also called erythrocytes from erythro = red + cyte = cell) are continually produced in bone marrow and recycled in spleen. In mature form they lack nuclei and most cytoplasmic structures; they are little more than discoid, flexible bags of hemoglobin. Example of normal RBCs, from WebPath. 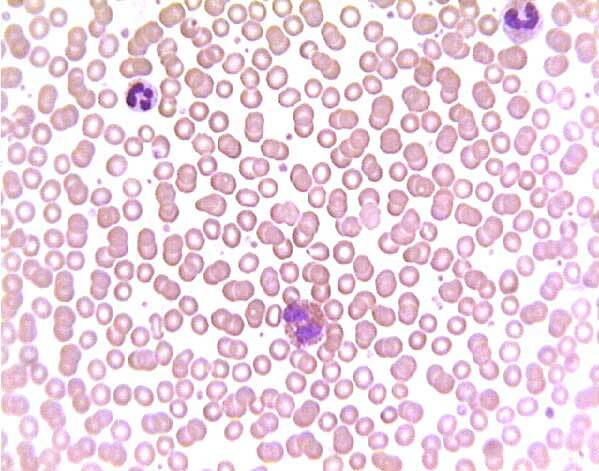 Another example of abnormal RBCs, from WebPath. Mature RBCs are nucleated in non-mammalian vertebrates (fish, birds, reptiles and amphibians) but are anucleate in all mammals (although there is some interspecies variation in cell shape). A common misconception (easily found on the internet) holds that camels are an exception to this rule. 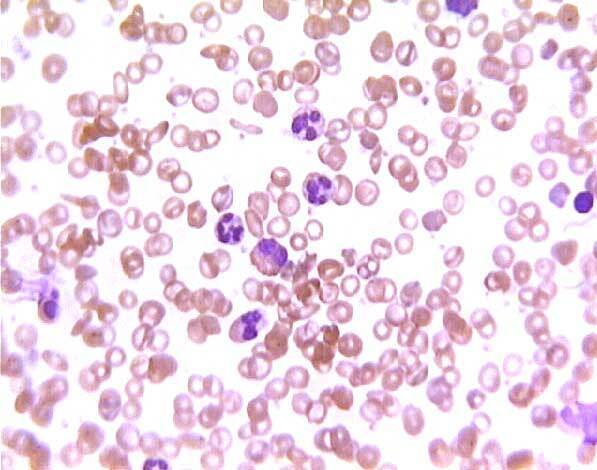 This mistake may have originated in the early years of histology (1800s), from observations of camels' ovoid RBCs which are thickest (and hence darkest) in the center. But the scientific literature has recognized this as an error for many decades (see quote below from 1928). Ponder E, Yeager JF, and Charipper HA (1928) Studies in Comparative Haematology: I. Camelidae. Quarterly Journal of Experimental Physiology 19.2 pp 115-126. "In stained films the red cells appear smaller than in the fresh state, but retain their shape remarkably well. When the cells are fixed in methyl alcohol, the haemoglobin is especially deposited in the central parts of the cell, which, as a result, take on a somewhat deeper stain than the peripheral areas. This appearance may possibly be responsible for the erroneous statement which has sometimes been made that the cells are nucleated ([Bottcher, Arch. f. mikr. Anat., 1877, xiv. 73])." Unfortunately, the same "erroneous statement" has been perpetuated ever since, notably in the otherwise-outstanding textbook, Mammalogy, by Vaughan, Ryan & Czaplewski, Saunders College Publishing. Here is a quote from the 5th edition, 2005: "In all mammals except camels (Camelidae), the erythrocytes extrude their nuclei..." [emphasis added]. This error continues, in spite of being noted by The Journal of Mammology (vol. 81, p. 916; 2000) in a review of the 4th edition of this textbook, ""The authors follow a long-perpetuated error in science, that camels have nucleate red blood cells." 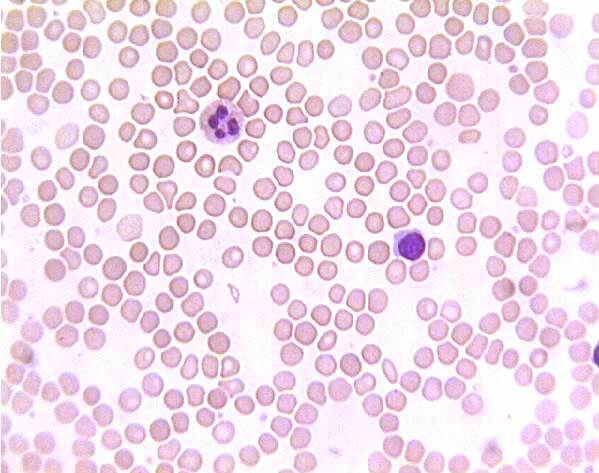 White blood cells (abbreviated WBCs, also called leukocytes from leuko = white + cyte = cell) comprise several distinct cell types, neutrophils, eosinophils, basophils, lymphocytes and monocytes. Certain developmental and morphological similarities permit the first three these cells to be usefully grouped together as granulocytes or polymorphonuclear leukocytes. The latter two types are then categorized as mononuclear leukocytes. Examples of WBC types, from WebPath. 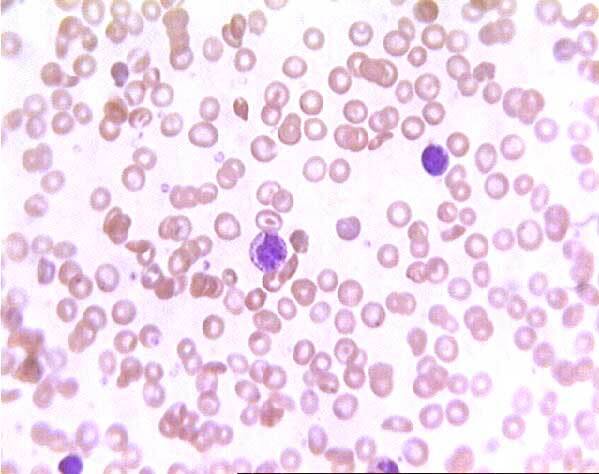 Granulocytes, also called polymorphonuclear leukocytes, have grainy cytoplasm and elongated or lobed nuclei. They arise in bone marrow from cells called myeloblasts and pass through stages called myelocytes and metamyelocytes. 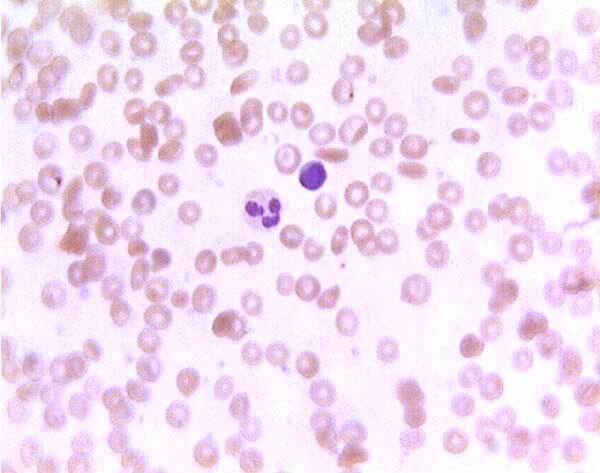 The granulocytes include neutrophils, eosinophils, and basophils. Too many neutrophils is called neutrophilia; see example from WebPath. The nuclei of mature neutrophils are elongated and pinched into several distinct lobes, hence the term polymorphonuclear. This characteristic nuclear structure confers a distinctive appearance on neutrophils, both in blood smears and in tissue sections. Immature neutrophils have a band-shaped nucleus and are hence sometimes called "bands". Mature neutrophils, in contrast, are called "segs", in reference to the segmented nucleus. Compare a band neutrophil with a segmented neutrophil at WebPath. See also an example of a pathological, hypersegmented neutrophil from WebPath. 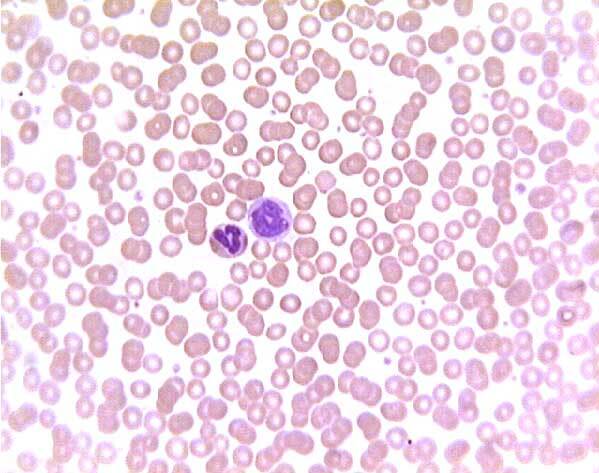 Neutrophils are only occasionally seen in normal tissue sections outside blood (except, of course, in inflamed tissue). Here they may be most easily recognized by their lobed nuclei. One neutrophil nucleus might be mistaken for a cluster of very small nuclei, but each of the lobes is much too small to be an entire nucleus -- only two or three �m across, much smaller than the nuclei of lymphocytes which are among the smallest of our cells. The function of eosinophils remains obscure, although they are known to proliferate in association with allergies and parasites. Basophils seem to be functionally similar to tissue mast cells, involved in triggering inflammation. Mononuclear leukocytes comprise both lymphocytes and monocytes. Both cell types work together in immune responses. Monocytes belong to the same functional population as tissue macrophages. Monocytes/macrophages engulf and digest foreign microorganisms, dead or worn-out cells, and other tissue debris. They interact closely with lymphocytes to recognize and destroy foreign substances. Most ordinary connective tissues contain resident macrophages which normally remain at rest in the tissue. But the normal number of fixed macrophages is supplemented during inflammation by the influx of many monocytes from the blood. Lymphocytes travel in the blood, but they routinely leave capillaries and wander through connective tissue. Therefore, lymphocytes may be normally encountered at any time in any location. They even enter epithelial tissue, crawling between the epithelial cells. They reenter circulation via lymphatic system channels (hence their name). Lymphocytes also emigrate from blood in response to inflammation, but they accumulate somewhat later during the inflammatory process than neutrophils. Their presence in large numbers indicates the continuing presence of antigen. Lymphocytes produce the multitude of diverse antibody molecules (one specific type of antibody per lymphocyte) which provide the mechanism for chemical recognition of foreign materials (distinguishing between self and non-self) and so for mediating and regulating immune responses. Lymphocytes are most easily recognized in histological sections as small "naked" nuclei (the cytoplasm is usually inconspicuous) which occur here and there in most connective tissues, especially commonly near mucous membranes. Lymphocytes are found densely packed in lymphoid tissue--spleen, lymph nodes, and lymph nodules in mucous membranes (e.g., tonsils, appendix), where they proliferate. Platelets are small fragments of cytoplasm derived from bone marrow cells called megakaryocytes (mega = large + karyon = nucleus + cyte = cell). Among the confusing proliferation of haemopoietic cells in bone marrow, megakaryocytes are easy to recognize by their huge size and large, lobulated nuclei. Small bits of megakaryocyte cytoplasm are continually pinched off to enter circulation as platelets, where they are important for blood clotting. The mechanism of platelet formation involves thin processes ("proplatelets") which megakaryocytes extend across bone-marrow endothelium into the blood flow. Shear forces in the blood tear small bits off the proplatelet processes, which may then fragment further in the lungs to form platelets. See Science 317:1689 (21 Sept. 2007). Dragging the scroll bar will enable rapid scanning of all images. 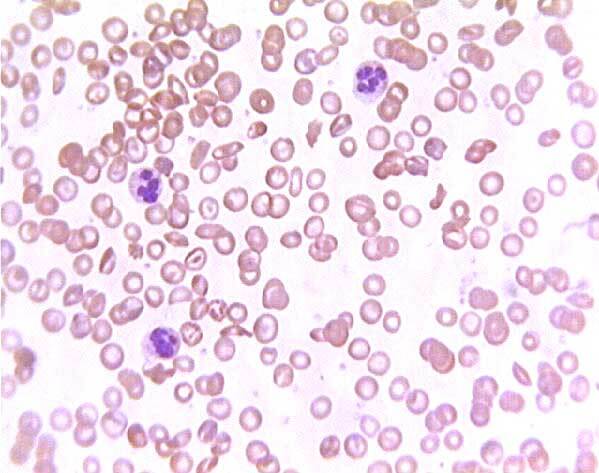 Note how easily you can determine when the images shift from the normal blood smear to the sickle-cell blood smear. 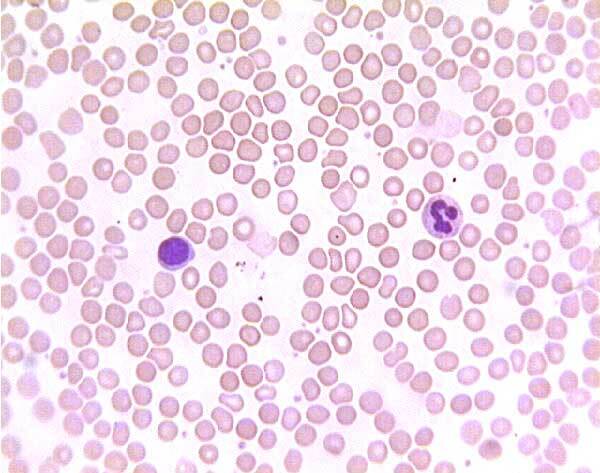 In a sickle-cell smear, many RBCs have irregular, flattened shapes (i.e., "sickle-cells") and some may have dark centers ("target cells"). 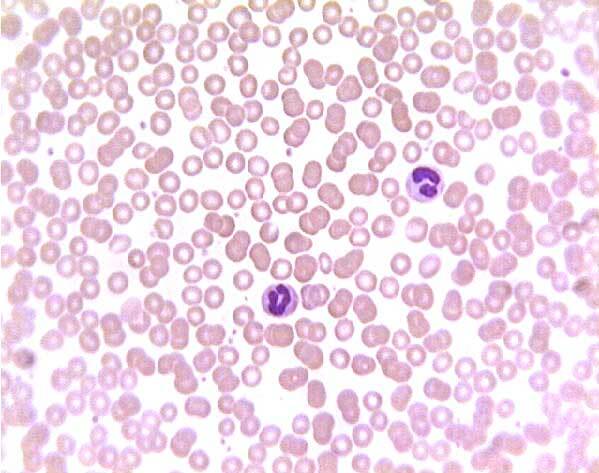 Example of normal blood smear, from WebPath. 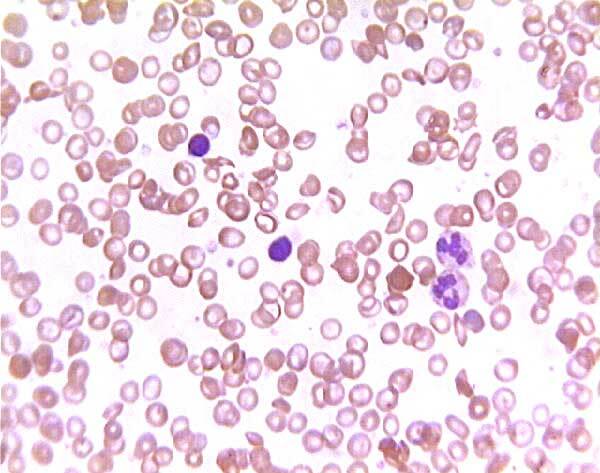 Example of sickle-cell blood smear, from WebPath. 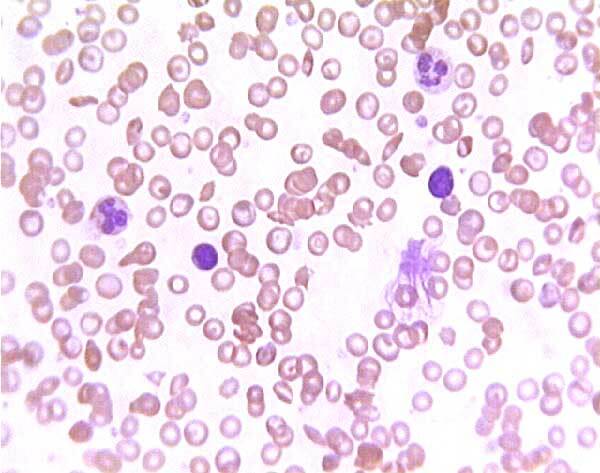 Example of hemoglobin SC blood smear, from WebPath. Normal (?) blood smear. 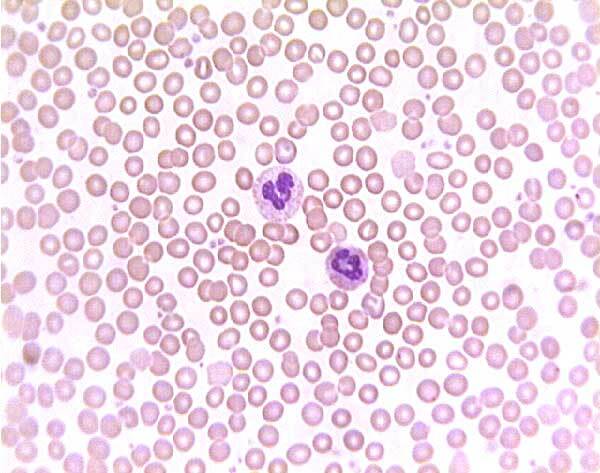 Click on any white blood cell to see its name. 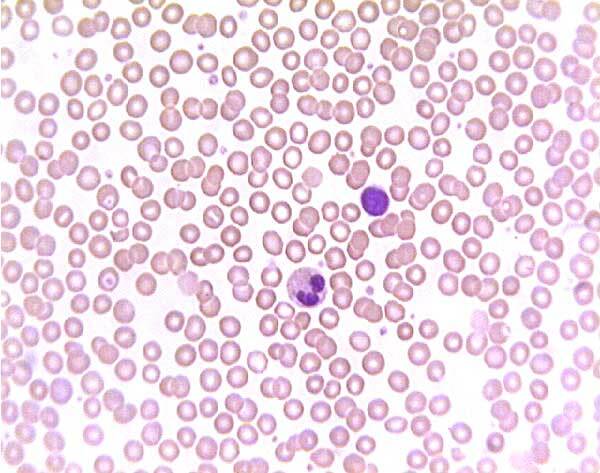 Sickle cell blood smear. 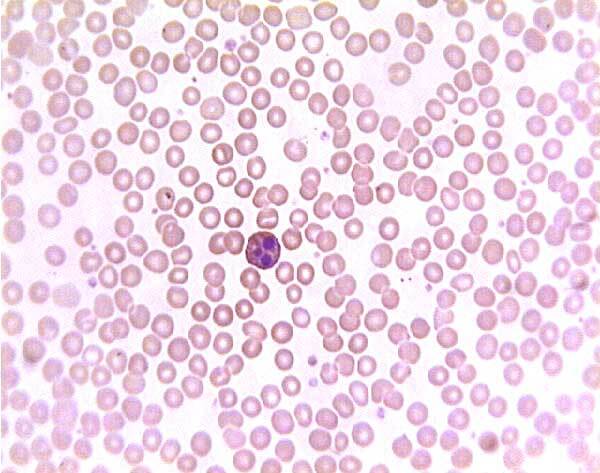 Click on any white blood cell to see its name.